There are various ways to transfer a real estate title, and among the simplest is a quit claim deed. The person is literally quitting their claim to the property. Just because it’s the simplest method does not mean it’s the best, however, especially if you are the recipient of the property. That’s because the quit claim deed does not guarantee that the grantor – the person transferring the property – actually owns the real estate in question. The grantee, or person receiving the property, not only could end up with a worthless deed, but cannot sue the grantor if it turns out that individual did not own the property or owned only a percentage of the land or buildings. However, if fraud is involved, it is possible to sue the grantor on those grounds. That does not mean you should always avoid quit claim deeds, but it does mean you should do your research. With a quit claim deed, you have the option of conducting a title search of the property, and that is crucial. A title search tells you not only who owns a piece of real estate, but whether there are any liens on the property. The most common type of lien is a mortgage, but other liens include a tax lien imposed by the municipality because property taxes are owed; a mechanic’s lien imposed by a contractor whose bill was not paid; judgment liens, imposed by a court for an unpaid creditor, and child support liens, also imposed by a court for unpaid child support. The IRS can also place a lien on a property for unpaid taxes. With a quit claim deed, the grantee ends up with all of those encumbrances with the exception of a mortgage and must pay them off. Think of a quit claim deed as an “as is” deed, with no protections. The most common type of deed used in real estate transfers is the warranty deed. Quit claim deeds are often referred to as “non-warranty” deeds. Warranty deeds state that the grantor owns the property, and has the right to transfer it to another party. The grantor of the warranty deed promises there are no claims on the title, which is not the case with quit claim deeds. The grantee enjoys a far greater level of protection with a warranty deed than with a quit claim deed. Both deeds are legal documents conveying real property. You can find a quit claim deed form for your state online and download it, or visit the recording office in the county in which the property is located and obtain a form. Along with the description of the property and its metes and bounds, or the direction and length of boundary lines, you must include the amount of consideration for the property, or what the grantee is paying for it. When the property is a gift, it is common to use $1 as the amount of consideration rather than zero. 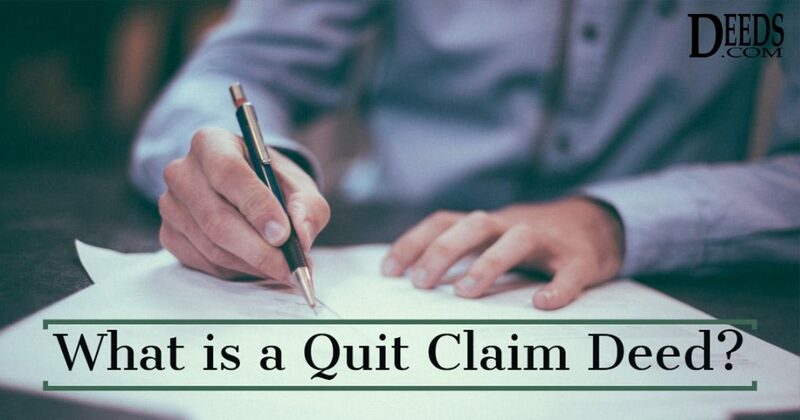 A quit claim deed requires the signature of all individuals involved and notarization. However, in this case the notary public is only affirming that the identity of the person signing the document has been verified, and not whether the quit claim deed is actually valid. Once the quit claim deed is signed and notarized, the property changes hands. How quit claim deeds are used varies by state. Texas and California, for example, are community property states. That means any property acquired during a marriage is owned jointly by both spouses. For that reason, quit claim deed forms in that state require notarization by both spouses if they are the grantors, since one spouse cannot transfer jointly owned property. In Florida, the quit claim deed must include the full legal name of the grantor and grantee, as well as a legal description of the property. The best way to find a property’s legal description is by consulting the warranty deed. It’s wise to include the property’s address in the quit claim deed. Under Florida statutes, the grantor must sign the deed not only in front of a notary public, but also in front of two witnesses. The latter must sign in the notary’s presence. A seller is not going to give you a quit claim deed if you’re in the market for a house or commercial property. Those types of real estate transactions require a warranty deed. However, there are circumstances in which a quit claim deed is the most cost-effective way to make a property transfer, and those generally involve transfers between family members. If your grandmother left her house to you, for example, the executor of the estate may find the most convenient way to transfer the inheritance is via a quit claim deed. A couple going through a divorce who have agreed that one spouse should receive sole ownership of the family home may find a quit claim deed meets their needs. If a relative wants to gift property to you, a quit claim deed is a good method for transferring ownership. A quit claim deed is also a way to add the name of someone to a deed. For example, if a couple marries and one spouse already owns a house, he or she can add the name of the spouse with a quit claim deed so the dwelling is in both their names. Besides real estate transfers, quit claim deeds are used to transfer business interests between parties. These are all valid uses for a quit claim deed. As a grantee, you never want to use a quit claim deed when the grantor is someone you don’t know well, with one exception. There are properties with such convoluted titles that obtaining clear title is virtually impossible. If you are willing to take a risk on a property with a title defect, a quit claim deed may prove your only choice, since you can’t get a warranty deed. Keep in mind that if you ever want to sell the property, the potential buyer is also taking the same risk. As with a warranty deed, the quit claim deed requires filing with county clerk or recorder, depending on the state. While the property still belongs to the grantee even if the quit claim deed is not recorded, failure to record it can open up legal issues for the grantee if there is a later challenge to the property’s ownership. When filing the quit claim deed, expect to pay applicable recording fees. Next PostNext What is a Contract for Deed?